Go to original pattern for design DROPS 171-47. 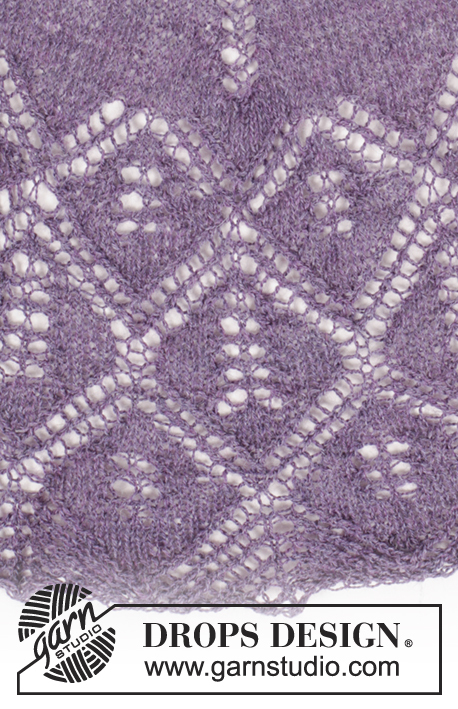 Knitted DROPS half-moon shaped shawl in stockinette st with lace pattern in ”Lace”. Measurements: approx. 50 cm / 19 3/4'' mid back, and approx. 170 cm / 67'' measured along upper edge after shaping. DROPS CIRCULAR NEEDLE (80 cm / 32'') SIZE 3 mm/US 2.5 - or size needed to get 24 sts x 32 rows in stockinette st = 4'' x 4'' (10 x 10 cm). 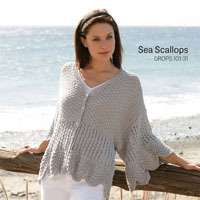 This garment is to be soaked and blocked/stretched to size afterwards so the knitting gauge is not that important. But to get a sense of whether you are working too loose/tight, work a test on needle size 3 mm / US 2.5 in stockinette st and get approx. 24 sts x 32 rows in stockinette st = 4'' x 4'' (10 x 10 cm). See diagrams A.1 to A.11. The diagrams show all rows in pattern seen from RS. 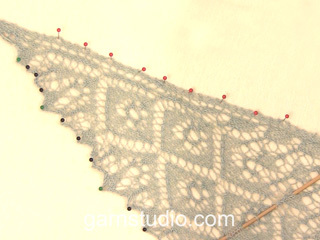 The shawl can be knitted with other needle sizes than those given here. 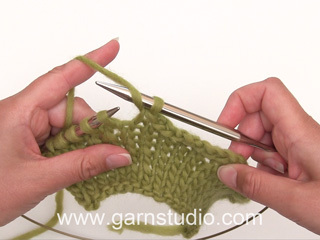 Use smaller needles for a smaller shawl and larger needles for a larger shawl. 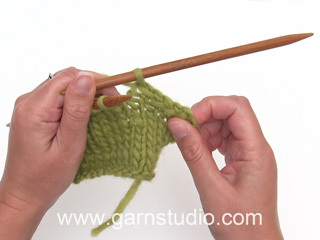 Stretch the shawl to shape at the end, possible uneven places should then even out. When using another yarn from yarn group A, there is no need to stretch the shawl to measurements, but place it gently out in shape. Leave to dry. Repeat the process when the shawl has been washed. ROW 1: 1 edge st in GARTER ST - see explanation above, 1 YO, 1 st in stockinette st, 1 YO, 1 edge st in garter st. Insert a marker in the middle st = 5th st.
ROW 2 and all rows from WS: Work 1 edge st in garter st in each side (K from WS) and P all sts and YOs. ROW 3: 1 edge st in garter st, K 1, 1 YO, K 1, 1 YO, K 1 and 1 edge st in garter st = 7 sts. ROW 5: 1 edge st in garter st, 1 YO, K 1, 1 YO, K 3, 1 YO, K 1, 1 YO and 1 edge st in garter st = 11 sts. ROW 7: 1 edge st in garter st, 1 YO, K 3, 1 YO, K 3, 1 YO, K 3, 1 YO and 1 edge st in garter st = 15 sts. ROW 9: 1 edge sts in garter st, 1 YO, K 1, 1 YO, K 3 and insert a marker in the middle of these st, 1 YO, K 1, 1 YO, K 3 (there is a marker in the sts in the middle of these sts = mid st), 1 YO, K 1, 1 YO, K 3 and insert a marker in the middle of these sts, 1 YO, K 1, 1 YO and 1 edge st in garter st = 23 sts. Work 1 edge st in garter st, A.1 over 3 sts, A.2 over 5 sts (first marker is in the middle of A.2), A.3 over 5 sts, 1 st in stockinette st (second marker is in the middle of this st = mid st), A.4 over 4 sts, A.2 over 5 sts (third marker is in the middle of A.2), A.5 over 3 sts and 1 edge st in garter st = 31 sts. 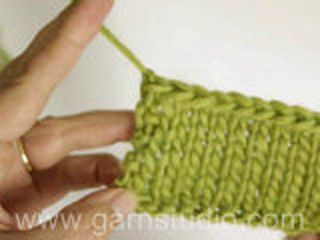 REMEMBER THE KNITTING GAUGE When A1-A.5 has been worked 1 time vertically, there are 51 sts on needle. Repeat inc as shown in A.x, inc alternately 4 and 8 sts on every row from RS (i.e. 12 sts for every repetition vertically), work the inc sts in stockinette st on each side of every A.2. Move the markers upwards when working to mark mid st and middle of A.2. Repeat as shown in A.x 24 times in total vertically, there are 339 sts in total on needle (piece measures approx. 35 cm / 13 3/4''). On next row from RS work and inc 4 sts as shown on first row of A.x = 343 sts. P 1 row from WS (work edge sts in each side of piece in garter st until finished measurements). K 1 row from RS and inc 1 st inside 1 edge st in garter st in each side = 345 sts on needle and P 1 row from WS. 1 edge st in garter st, A.6 over 4 sts, repeat A.7 21 times (4 sts remain on needle), A.8 over 3 sts and 1 edge st in garter st. 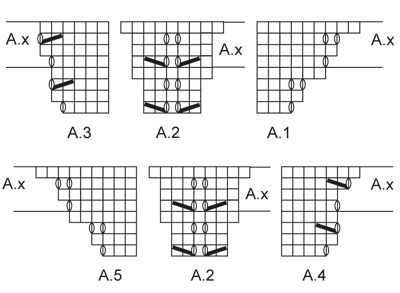 NOTE: In diagram 2 sts are inc on the 11th row in every repetition of diagram A.7, A.6 and A.8. And 2 sts are inc on 17th row of A.6 and A.8. Work diagrams 1 time vertically = 429 sts. Work according to diagram A.9 to A.11 as follows from RS: 1 edge st in garter st, A.9 over 7sts, repeat A.10 23 times (7 sts remain on needle), A.11 over 6 sts and 1 edge st in garter st. 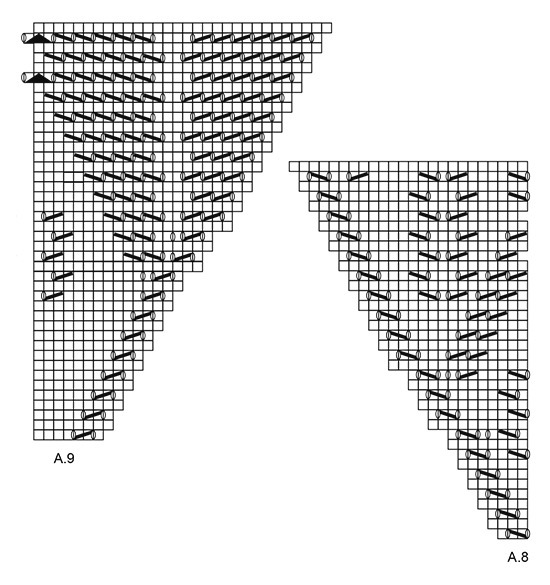 NOTE: In diagram 2 sts are inc on the 17th row in every repetition of diagram A.9, A.11 and A.10. And 2 sts are inc on 21st row in A.9 and A.11. Work diagrams 1 time vertically = 521 sts, but on last row from WS loosely bind off with P.
Place the shawl in lukewarm water until it is soaking wet. Carefully squeeze the water out of the shawl - do not twist the shawl - then roll the shawl in a towel and squeeze to remove more water - the shawl will now only be moist. If another yarn from yarn group A is used - read SHAPING above. Place the shawl on a carpet or mattress - carefully stretch it out to size and fasten it with pins. 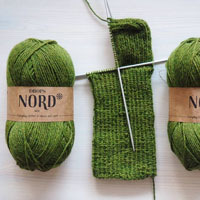 If desired shape the edge by stretching a little bit in the area between the leaves to form tips and fasten these tips with pins along the bind off edge. Leave shawl to dry. Repeat the process when the shawl has been washed. 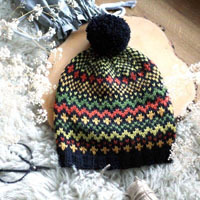 The pattern has been edited from where diagram A.9, A.10 and A.11 starts. 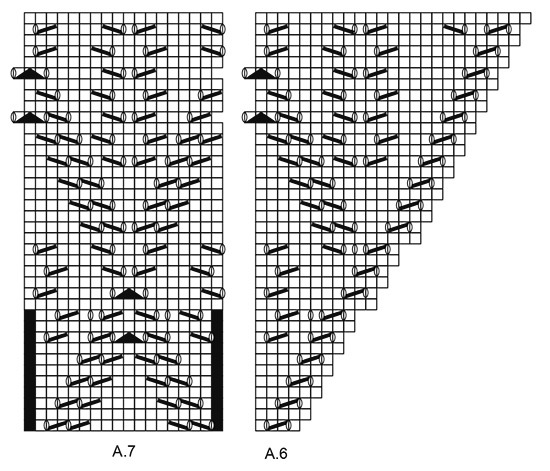 The diagrams have been edited, A.6 and A.8 has been edited on the last 14 rows. 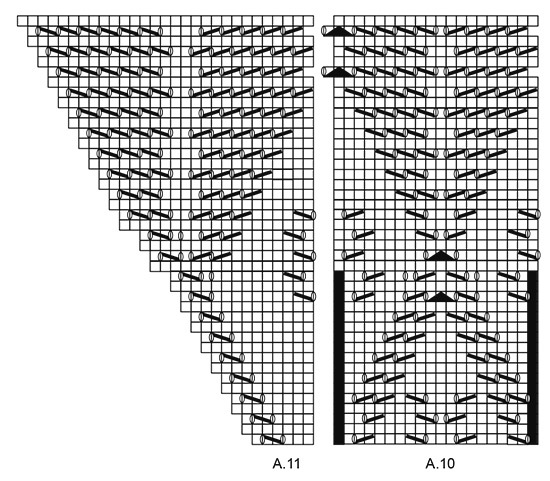 Diagram A.9 and A.11 has been devided in a new way and have been edited in the first 3 rows and in the last 24 rows. = slip 1 st as if to K, K 1 and psso.